If you have been hurt on the job in Illinois, you likely have dozens of questions about workers’ compensation coverage. This article should provide a quick overview of the types of benefits, eligibility requirements, and other basic facts about employee injury coverage under state law. Is my employer required to carry workers' compensation insurance? Yes. Under state law, all employers with more than one employee must have workers' compensation coverage. What kinds of injuries are covered? The Illinois Workers' Compensation Act covers any injuries that have been caused or worsened by the employee's work. This can include illnesses caused by workplace exposure, the exacerbation of a pre-existing condition, or work-related accidents that occur outside of the workplace. What if I am partly at fault for my injury? Illinois law provides payment for work-related illnesses or injuries regardless of who is at fault, except in cases where the employee was intoxicated at the time of the accident. Can I sue my employer for causing the accident? Workers' compensation was created to guarantee wage and medical payments to injured employees without the need for filing a lawsuit. In exchange for these benefits, the employee is prohibited from filing a lawsuit against the employer. However, the employee can file suit against a third party whose negligence led to the injury. Can I be fired for filing a workers' compensation claim? No. It is illegal for any employer to fire, harass, or otherwise discriminate against an employee who seeks or collects workers' compensation. In the days after you have suffered a work-related injury or illness, you will need to take certain steps to begin your workers’ compensation claim. For example, you should seek medical attention and officially notify your employer of the injury as soon as possible. Once you have missed more than three days of work, your employer is required to submit an accident report to the Illinois Workers’ Compensation Commission, but you will have to complete the paperwork to file your workers’ compensation claim. Medical payments. Workers’ compensation is required to cover any reasonable and necessary medical care needed to treat injuries or relieve symptoms of the injury. Temporary total disability. These payments begin after your claim is approved and are meant to provide income for the period between when you have been hurt and the day when you return to work. Temporary partial disability. Once your injury has healed to the point where you are able to perform light-duty work, temporary partial disability benefits are used to make up the difference between the amount you are able to earn and your usual salary. Permanent partial disability. If you will never fully recover from your injury, but you are able to perform some types of work, you may collect permanent partial disability benefits to supplement your income for the rest of your life. Permanent total disability. If you have suffered debilitating and permanent effects from the injury that will prevent you from working ever again, permanent total disability benefits can provide necessary income for the rest of your life. Death benefits. If an employee is killed in a job site accident or succumbs to a work-related injury or disease, surviving family members may collect death benefits for funeral costs, lost income, and other end-of-life costs. 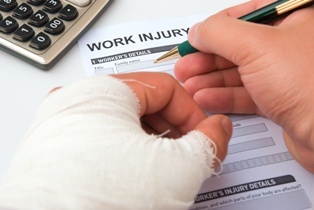 Many employees will face challenges at some point in their workers’ compensation claims, and may have to prove that their injury is work-related before the may be granted benefits. If you have been injured on the job, we can advise you on your next steps at no cost to you. Contact the experienced workers' compensation attorneys at Tapella & Eberspacher today at (855) 522-5291 or fill out our online contact form to schedule your free consultation.